Pit stop at Tollkeeper's Cottage. Pit stop at Tollkeeper’s Cottage. This Sunday marked the second, now annual, Davenportage—a 16.5 kilometre portage from the banks of the Humber River skirting the top of downtown Toronto to the Don River. 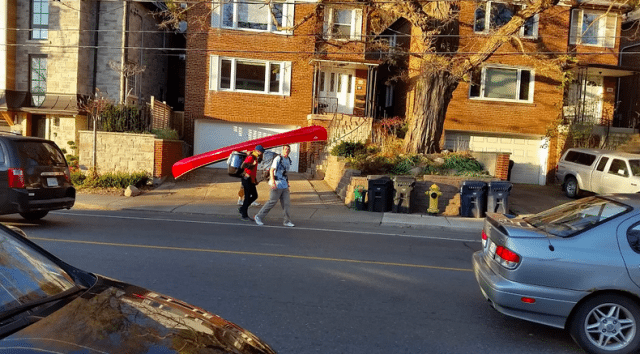 Yes, that’s right: a trek across a significant portion of Canada’s largest city with a canoe on your shoulders. My love of all things canoe, Toronto and quirky piqued my curiosity enough to participate in this year’s Davenportage. I was able to convince a few buddies to join and we met the group gathered at Etienne Brule park on the shores of the Humber River just north of Bloor to begin this bizarre journey. We were met by organizer and Davenportage founder Michael Bumby, who, along with two others, began his journey hours earlier by paddling down the Don River, across the Toronto harbour and up the Humber. Bumby and his crew, already 19 kilometres of paddling into their day, were set to complete their loop back to the Don along with four additional canoes and 19 so-called “historian athletes”, ranging in age from eight to 60. Mike Ormsby, a Curve Lake First Nation elder and canoe builder, led the participants through a smudging ceremony to honour the beginning of our journey. He explained that our route was believed to be the oldest footpath in Ontario and part of an established network created by First Nations to connect important trading areas throughout the lower Great Lakes and north to Lake Simcoe. Ormsby left us with prophetic parting words: “You don’t know the land until you’ve walked it.” We threw the canoes on our shoulders and headed north. Carrying a canoe along the Humber River felt novel but, given our natural surroundings, not much different from long portages one might take in Algonquin Park. This familiarity disappeared as we emerged onto a dusty Dundas St. W where we were met with honks from passing cars, some surprising aggressive questioning from some fellow pedestrians, and long “why the heck would you want to do that” stares from just about everyone else. The kilometres clicked slowly as we headed east towards the start of Davenport Road. My shoulders began to tense up, my hamstrings tightened, and the canoe started to feel heavier. But the stares? Those never seemed to change. In just over two hours we had covered the first 11 kilometres, crossed the Humber watershed, and hiked over the now-buried Garrison Creek and into the former Taddle Creek watershed. At the foot of the 13,400 year-old escarpment formed by the former Lake Iroquois, we took a break to indulge in pea soup and biscuits provided by the volunteers at the Tollkeeper’s Cottage. After another four or so kilometres through the Annex and Yorkville, the novelty of the experience began to fade. By the time we entered into the Yellow Creek and Don Ravine system, a sense of déjà vu kicked in: canoe on my shoulders, middle of the woods, with good buddies passing around a flask to get us through the home stretch. Clocking in at just over four-and-a-half hours from our start, our group found ourselves near Evergreen Brickworks where Bumby and the first canoe had departed nearly 10 hours earlier. Mike Ormsby was was right in his words when he sent us on our way- having walked the land I do feel a newfound appreciation for it. Purposefully exploring the city by foot proved a great way to connect with the rich history along this ancient trail. The Davenportage, in just its second year, was by all accounts a great success. The event will no doubt garner greater attention and participation in the coming years. If you’re up for a bit of a challenge and fancy yourself an athlete historian, then I can’t wait to see you out at next year’s portage. I’ll be there—in a new pair of running shoes.